AY Makun’s other films have nothing to do with this one. Slowly, AY Makun has evolved from plain comedy to creating interesting plots and sub-plots. 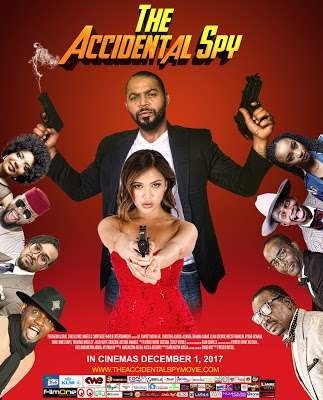 In “The Accidental Spy” (same name as the 2001, Hong Kong Martial Arts film that stars Jackie Chan), AY Makun adds something that is beyond being a comic as seen in 30 Days In Atlanta, A Trip To Jamaica and 10 Days In Sun City. There is a ‘higher purpose’ that he combines with these other familiar elements to form the theme of this movie. The movie has tremendous potential as it breaks the norm but certain factors add and subtract from its overall visual brilliance. The character, Manny (Ramsey Nouah) is having a terrible time in his relationship and career - He was demoted to customer care and his girlfriend, Vanessa (Rahama Sadau) leaves him for his boss. Light shines back into his life after he wins 5 million Naira in a lottery, and takes a break from all the Lagos hustle as he goes on vacation to London. While assuming that he had registered for a reality TV show, where he gets to play a spy, Manny ends up being the target of a Lagos based cartel who are determined to assassinate a lady who is trying to make electricity almost free for all Nigerians. The Cartel hire a well known assassin named Viper played by American actor, Miguel Nunez, but because of the bumbling emissaries (EmmaomaGod and Ay Makun) sent by the cartel to the deliver the instructions and the target, Manny ends up with the car and the money meant for the assassin. The central character responsible for tracking down and capturing Viper, Officer Walker (Christine Allado) begins to develop feelings for Manny after she discovers he was accidentally mixed up in the plot. This is the premise on which the movie runs on for most of the time, with Manny unaware most times of what he has gotten himself into. The director and producers of 'The Accidental Spy' gets it right with the pacing, picture quality and casting. Ramsey Nouah, Miguel Nunez, Rahama Sadau, Christine Allado, EmmaomaGod, Ay Makun and David Jones Daniel interpret their roles perfectly leaving the audience engaged and entertained. Bryan Okwara and Ali Baba seem to have missed the mark. Unfortunately, Bryan Okwara's acting was not memorable, Ali Baba tried to hard to be a villain and funny at the time. For the first time in an AY Makun film, he was not the central character, and he did an excellent job of being a blundering goon alongside, EmmaomaGod. He kept dropping interesting one liners, like when he was arrested by the police in the the UK he kept saying 'Abeg who blow this whistle' and when Manny played by Ramsey Nouah unknowingly dodged a bullet - Ay said 'This guy nah winch'. The picture quality was crips and top notch, audio was clear and after effect was well used. However, the subtle attempt to 'sell the market' of obvious sponsors was not subtle in any way. In all, the crux of 'The Accidental Spy' which appears to show that when common Nigerians are united, they cannot be held in physical or psychological chains by a few corrupt leaders and cabals was well articulated. Movie goers will definitely want to see this in the cinemas not just because it has a hunk like, Ramsey Nouah as the lead, but because the film is funny in a mature way, full of action and makes a lot of sense.